"If food waste can become not an outlier, but become a mainstream cultural acceptance. Then, we'll stop calling it 'food waste'." For London food adventurers, the pop-up WastED is one of the most exciting events of the year. When I first saw the announcement in January, I immediately booked the reservation and was very glad that I did, as it was sold out super quickly. WastED is a collaborative food project led by chef Dan Barber. It's a community of chefs, farmers, fishermen, distributors, processors, designers and retailers, all coming together to reexamine “waste” that occurs at every link in the food chain. The capital 'ED' represents 'education', and through the format of pop-up, the chef wanted to create a context that allows people to rethink about our everyday diet consumption. The first WastED launched in New York 2 years ago. This time, after a whole year of preparation, the team has brought the experience to London, taking place at Selfridges iconic rooftop. Beyond the WastED team themselves, more than 20 chefs from throughout UK and Europe will be joining the team to provide daily menu specials. Overall, I really enjoyed my time at WastED – from the moment we stepped into the elevator, seeing the main entrance with the dim lighting, walking through the pathway with different screens showing the process of food (it's almost like through a time portal going on a food journey), and led to the reception...til we were seated at the bright, spacious rooftop (yes! we're lucky that it was sunny!). The menu carried on with the theme of food waste, and introduced different ingredients being used, and even the naming of the dishes are quite playful, for example, ugly tortilla and rejected shortbread. I also really enjoyed how they provided the music playlist selected by the guest chef. It not only made me aware of what I'm eating, but also what I'm listening to – creating a truly multi-sensory experience during the next couple hours. There was a 7-course tasting menu but we opt for ordering individual dishes so we could try the things that we wanted. The most mind-blowing dish was the WastED Special by guest chef Wojciech Amaro. The Polish trio miniatures were each very unique, unlike anything that I've ever tasted. Truth to be told, if the staffs didn't tell me what they were, I probably wouldn't be able to identify what they were, but just knowing that the combination of texture and flavor blended so well together. 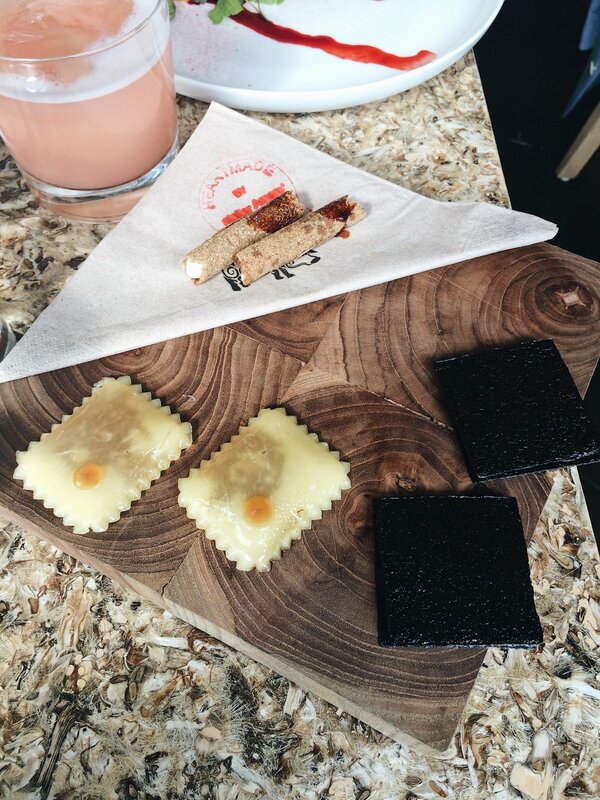 I can't recall the detail ingredients of all, however, the black square one is made from burnt onion on the outside (black crispy part) and the middle fillings were made with chocolate and pig blood. It's both sweet and savory at the same time and I love the combination of the crispy and smooth mouthfeel. The 'ravioli' looking one is made with cheese, and the 'glaze' look was from 78-degree hot water to create the look of cheese coming straight from the water according to the chef. Even using pig foot as a prop is considering 'reuse', no? Not only was the food thoughtfully curated, the space itself is also designed to educate people about food waste but in a less intimidating way. Different components become a part of the installation, which the guests could walk around during or after the meal. In the back balcony, there's also an area where they grew plants and greens. Carbonized animal bones becomes charcoal for grill. Watch the great interview with Dan Barber to find out more about the concept of WastED. A documentary of my thought process.